Have you contemplated those gorgeous but pricey sewing table stations, complete with air-lifts for your machine? Getting your machine set down with the stitching surface flush with table height – so that you can work in ergonomic comfort – can make all the difference. When I set up my current studio, I had one on order that never arrived (long sad shipping story). 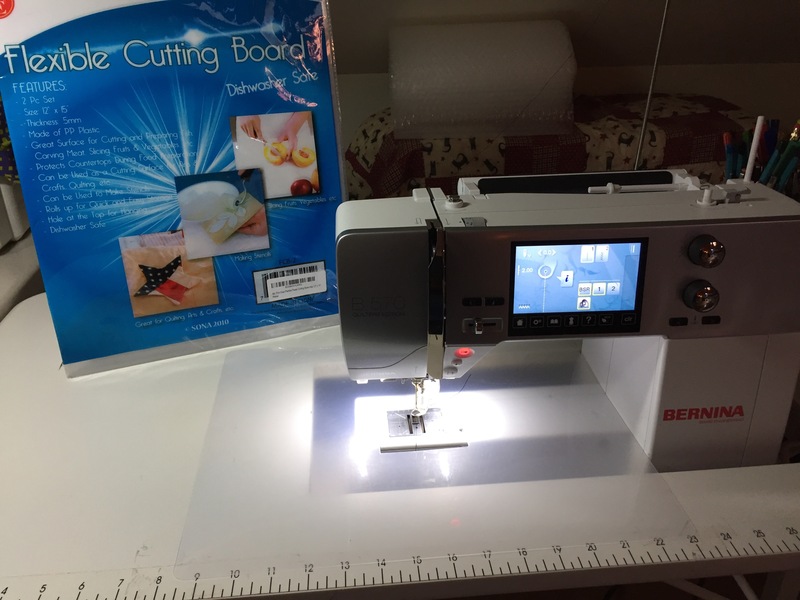 As an interim solution, I purchased a very inexpensive small table from Sears with a chain-attached drop-down piece for the sewing machine (and put a folding table next to it for surface space). Next step…how to improvise in those custom-cut clear inserts that fit around your free-arm and provide that seamless surface? As I stood in a kitchen supply store, I stared at a package of (v v inexpensive) flexible cutting surfaces – sometimes they come in assorted colors. Hmm. As it turns out, they are a brilliant surface for this purpose. Simply cut a square hole large enough for your stitch plate (carefully! With a straight-edge cutter), place over the opening, and tape in place. These cutting sheets tend to be very slippery (perfect) and are so cheap that you can simply replace them when they become dirty. The money you save can be put to excellent use…say, on your Bernina :). This entry was posted in Uncategorized on December 9, 2015 by neonkittyquilts.